Gretchen and Kyle take a long hard look at the second anime film in the Polygon trilogy of Godzilla Anime films. We’re back and discussing another brand new entry in the Godzilla series: GODZILLA CITY ON THE EDGE OF BATTLE. Specifically, this is the second film in Godzilla’s first-ever animated trilogy. It should be an exciting time, but overall, these animated films are not delivering for the fans (at least in my observations). Just like the listeners, we are doing our best to find the goodness amongst the mediocre, but this trilogy-so-far is making doing that difficult to say the least. If you are unfamiliar with these films, they were part of an animated deal between Toho and Netflix struck back in 2016. Once they are released theatrically in Japan, Netflix gives the films a two month break and then internationally takes care of distributing the films on their platform. 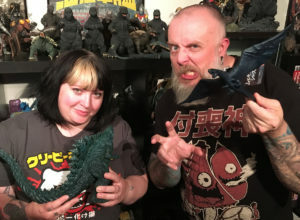 If you missed our discussion of the first Anime film (Godzilla: Monster Planet), you might want to give that a listen first. And if you haven’t seen this entry, our discussion gets pretty specific, so please acknowledge the SPOILER WARNING, peoples! SDCC Teaser for Godzilla King of the Monsters dropped on July 21st! 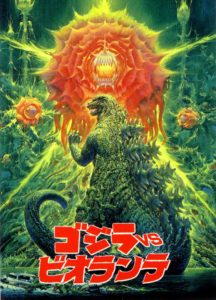 Next month, we are going to be watching 1989’s Godzilla vs Biollante for our series of Re-Discussions. Orginially we talked about this film during a recording I made in Idaho at Anime Oasis back in May of 2010. That means that the discussioneers were all attendees of the convention, but this time, I’m hoping to get some of my awesome cohosts in to watch the film. If you’d like to be part of our episode, make sure you send you homework in via our handy contact form by or before Aug 24th to be included in the show.